Since I’ve been practicing therapy, no other societal event has been so present in my clients’ sessions as the Sandy Hook Elementary school shooting in Newtown, Connecticut on December 14, 2012. For the weeks following, nearly every client came in wanting to talk about it to some extent. I was struck by the depth and breadth of this tragedy’s reach for people. Some expressing grief, others fear, and many exploring existential/spiritual questions. Many diving into the details of the news reports to try to make sense of it—even while admitting that nothing they could learn would really suffice. And others purposefully avoiding the media because it was just too painful. Something in our collective consciousness seemed to have been breached. A line crossed. A “bottom” to use the language of recovery. What happened in Newtown seemed to be for so many an assault on Innocence itself. On a precious part of our humanity and consciousness that we all, regardless of background and creed, seem to have a tacit agreement about: that childhood innocence has inherent value and deserves protection and preserving. As I continue to process the impact of this in my life and work, I return again and again to the Jungian concept of The Shadow—of looking to our outside world as a reflection of our inner world. While participating in dialogs and taking action to reduce these tragedies is critically needed to produce change in the outer world of our society, it is often difficult to believe that we, individually, can do anything. If we stay with Jung’s idea, though, and participate in dialog and action to reduce the tragedy of assaulting our own Innocent One within, we would not only feel more hopeful of having impact, we but could begin to see that change reflected in the world. Consider that the innocent child who you once were lives within your mind and heart as a part of you. This Innocent: this precious one who has inherent value and deserves protection and preserving. This part of you who is full of wonder, creativity, joy, freedom, trust, and [insert one of your favorite childlike attributes here]. This part of you who also has mischievous curiosity, self-centered focus, a naïve sense of power, and [insert one of your least favorite childlike attributes here]. You don’t have to picture yourself as a child if you don’t want to (although it can be very powerful to do so), just pick the characteristics and focus there. When you do, see how it feels to acknowledge this part of you. A part of you that over time, external instruction, and often shame-based experience has been silenced, dismissed, or cut short from participating fully in your life. How often do you criticize and shame yourself for being joyful, trusting, much less to focus on yourself and daring to wonder about how powerful you really are? Imagine if you let that part of you have a say, have a life inside you? No, not as the ultimate “decision maker,” but as a valid voice to be heard and taken into consideration instead of silenced. Part of what pains us about the Sandy Hook tragedy is that young children’s lives were cut short. Allow yourself to feel the sorrow and compassion for them and their loved ones and send them the energy of love and healing. Then, imagine that energy of sorrow, compassion, love, and healing, making a circle back to you. While feeling that, commit to valuing, protecting, and preserving the Innocent part of you each day. And when you fail, instead of shaming yourself with cutting criticism, try the following: 1) admit that you failed, 2) feel the regret, 3) forgive yourself—remembering it’s a shame-based defense that has become habit—and then 4) choose to re-commit. Allow the Innocent One Within to participate more with your daily life and you just might find that your life becomes more full of wonder, creativity, joy, freedom, trust, self-care, and empowerment. And the world outside just might follow suit. Before heading into the park for my midday run, I watched President Obama announce his plans to help reduce tragedies such as Newtown in the future. Standing behind him were four children who had written letters to the President asking him to help. Sitting in front of him were the parents of a girl named Grace who died that day in her classroom along with her classmates and teacher. The President shared that he placed Grace’s artwork in his private study in the White House. Feelings of sadness and anger surfaced in me anew as I watched and listened, but the stirrings of hope now swirled in with the mix. As the President shook the children’s hands and began signing the paperwork, I took to the sidewalk and started jogging toward the park. The January day was gray and damp. That seemed alright and somehow fitting to me as I put in my earbuds and set my iPod to shuffle. I jogged along feeling grateful to be outside in the world moving free and breathing deep. On my exhales, I released the heaviness in my chest and upon inhale, I invited the shuffled songs to guide me to thoughts and feelings that would feel right to me on my “moving meditation” that my runs have become. Toward the end of my run, an upbeat song began playing, instantly bringing thoughts, feelings, and images of my family—especially of my three children. The song’s beat brought the gift of a rush of gratitude and joy. That gift, though, was quickly threatened to be revoked by pained thoughts of the families who lost their children that December Friday in Newtown. I firmly held on to my gratitude, though, as Brene Brown teaches in her work on vulnerability and shame resilience. I then eased into a trust that somehow my love for my children somehow honored those lost at Sandy Hook. As I rounded a bend in that moment, my eyes scanned the corner of the park looking for the carousel that had been set up for the holiday season. It was gone. Clearly, the season now over, it had been taken down. It seemed to have vanished into thin air, leaving an empty space at the foot of the hill with only an imprint in the grass. My heart filled with the ache and loss of Newtown’s children again as I approached the empty space. But in a spinning rush of momentum and spontaneity, I turned off the paved path and leaped onto the carousel’s flattened grass imprint. Shaking off my self-consciousness that onlookers might consider me strange, I resolutely ran the circumference of where the carousel once stood. 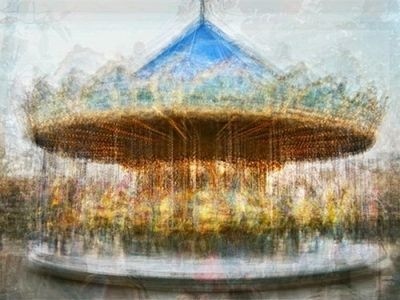 While making the round, I imagined the carousel there with Newtown’s children aboard riding, laughing, and carrying on as kids do. At the moment I reached the point of completion of the carousel’s circle, it started to rain. Hard. As if the gray day could not hold its tears back any longer, the sky burst open above me. The synchronicity of that timing stunned me so much that I stopped running and looked up. I have never particularly enjoyed getting caught in the rain, but this time I instinctually welcomed it. I slowly opened my hands toward the sky and then, with a child-like impulse, I leaned my head back to catch the rain in my mouth—just as the lyrics to the next song playing in my ears sang of catching tears. Stunned again in the synchronistic mystery, I felt a profound connection to Mystery and Oneness with All That Is. My singular and symbolic experience felt beyond the bounds of me yet I also sensed my personal and particular participation provided a key ingredient. The synchronicity of sound, imagery, and elements served as a reminder of the interconnection between our individual and interconnected experience. A reminder of Belonging—to ourselves, each other, and to our world. As we move forward in this world that does indeed break our hearts, I hope that we can more and more use that brokenness as an opening. An opening to more love than our heart could have held had it stayed together in the first place. can make a heaven of hell and a hell of heaven. This is a quote from John Milton’s Paradise Lost. I use it at the beginning of my auto-biographical statement on our Karuna website. To tell the truth, I’ve had concerns about it ever since I posted it because it can be perceived as harsh and blaming depending on how you look at it. For example, the quote can be taken to imply that if you’re in pain about something, it’s only because of how you’re looking at it – if you’d just look at it differently, it could be heaven instead of hell. But is that true in every situation? Shakespeare suggests it is in his line: “There is nothing either good or bad, but thinking makes it so.” But what about the death of a loved one, or a crippling accident caused by a drunk driver, or physical assault? Doesn’t the sentiment in the quotes seem like “blaming the victim” in those incidences? Given these issues, I’d like to talk about why I chose that particular quote and what it means to me. My primary intention in choosing the quote was to emphasize (1) the importance of perception on reality, and (2) the importance of the meaning we ascribe to the events of our lives, and (3) to highlight how powerful our thinking is in terms what it can create. Most people are familiar with the two images below that emphasize how perception can change with perspective. In the image on the left, can you see the chalice? Can you also see two faces looking at each other? The chalice appears in white against a black background. The two faces appear in black against a white background. In the image on the right, can you see the young, attractive woman? Can you also see the old lady? To see the old lady, focus on the young woman’s necklace and let it become the old woman’s mouth. Let the young woman’s ear becomes the old woman’s eye. Can you see it now? Try going back and forth quickly between the two versions in each picture. Can you get to the point where you can see both images equally at the same time? (Do you have a headache yet?) Most people have trouble with being able to see both images at once. They can shift back and forth very quickly, but it’s difficult for the mind to hold both images at the same time. 1. “What a jerk. How rude. Some people have no manners.” In other words, you blame the other person. 2. “Oh no, did I something that offended her. I bet she’s upset with me.” In this case, you blame yourself. 4. “I wonder if ____ got my message. Maybe she’s just busy. I’ll call her again in a day or so if I don’t hear from her.” Here you attribute a neutral meaning to the event so neither one of you has to be the bad guy. Consider what feelings might come as a result of each thought. If you tend to think more like #1, you’re going to spend a lot of time angry, self-righteous, and critical of others. If you think more like #2, you’re going to spend a lot of time worrying, blaming yourself, and reinforcing your negative self-image. If your particular flavor of hell is ambivalence, #3, you’re likely to drive yourself crazy going round and round in circles. An unenviable by-product of 3 is that you’re also likely to drive everyone around you crazy as you try to get 100 reality checks from other people to decide who to blame. If you think more like #4, you’re going to spend a lot of time getting on with your life with feelings of peace and equanimity because there’s nothing to blame anyone for – what a heavenly mindset. So what about you? Do you tend to create more of hell or heaven with your thoughts? I could now go on to tell you about how our childhoods set us for this kind of dualistic thinking. I could explain how the fear of being wrong/bad leads to the defense mechanisms that make us want to project the blame. I could explain how ambivalence, though often agonizing, is actually a step in the right direction because ‘staying in the tension of the question’ at least keeps the mind open. The mind tends to close once we think we have the answer. I’d rather talk about this issue from a larger perspective, i.e., how the penchant to engage in more hellish than heavenly thinking is not totally our fault. We are, after all, also a product of our evolutionary stage of existence. The physical plane of existence into which we (humans) were born forced us, for the sake of our survival, to make dualistic distinctions between danger and safety, friend and enemy, life-enhancing and life-threatening. This plane of existence also had opposites to which we had to accommodate ourselves: day and night, summer and winter, wet and dry, hot and cold. Dualistic thinking was necessary to cope successfully with life on this plane of existence. Our tendency to see things dualistically has keep us safe and well for millennia — even lending itself to the invention of the computer which employs a binary operating system of zeros and ones much like our own dualistic mind. Our dualistic thinking is such a part of our current state of being/thinking that we hardly notice it. Black/white, good/bad, right/wrong, success/failure, smart/dumb, ugly/pretty, top/bottom, pleasure/pain, true/false, win/lose. Our level of consciousness, evolutionarily-speaking, has been fraught with dualistic distinctions. This plays out in small things and large. Either the friend in the example above is bad, or I’m bad. Either she is at fault or I am. If we alter our thinking at all it is likely to vacillate back and forth between the two. Dualistic thinking can be found at the global level, too, often in ways that no longer serve us well on our island home. Christians good, Muslims bad. Straight people good, gay people bad. This political party good, that one bad. This skin color good; that one bad. This kind of thinking can often lead to a literal hell on earth – divisiveness, judgment, disconnection, separation, conflict. Does a higher, more “heavenly” level of consciousness exist, and if so, how might we participate in actively ushering it in? You probably know that a dog’s ability to hear and smell exceeds that of a human. You probably also know that there are ranges on the light spectrum (e.g., ultraviolet) that the human eye cannot see. Did you also know that the human eye can only perceive ¼ of what it sees? What if there are levels of consciousness that we can’t apprehend yet either – levels that exist outside the bandwidth we can recognize? Or said a better way, levels of consciousness that lie as undeveloped potential inside us. Many of the great avatars of the past stressed the importance of transforming our minds, transcending the usual dualistic mindset of the times. Consider Buddha’s non-attachment to outcome, Jesus’ “love your enemies”, Gandhi’s passive resistance. Perhaps avatars were so misunderstood in the past because their level of consciousness exceeded the current level of human consciousness. Are the mystics and sages insane? Because they all tell variations on the same story, don’t they? The story of awakening one morning and discovering you are one with the All, in a timeless and eternal and infinite fashion. Yes, maybe they are crazy, these divine fools. Maybe they are mumbling idiots in the face of the Abyss…. But then, I wonder. Maybe the evolutionary sequence really is from matter to body to mind to soul to spirit, each transcending and including, each with a greater depth and greater consciousness and wider embrace. And in the highest reaches of evolution, maybe, just maybe, an individual’s consciousness does indeed touch infinity—a total embrace of the entire Kosmos—a Kosmic consciousness that is Spirit awakened to its own true nature. It’s at least plausible. And tell me: is that story, sung by mystics and sages the world over, any crazier than the scientific materialism story, which is that the entire sequence is a tale told by an idiot, full of sound and fury, signifying absolutely nothing? Listen very carefully: just which of those two stories actually sounds totally insane? Wilber, A Brief History of Everything, p. 42-3. So what will help with this evolution of consciousness besides not participating in dualistic distinctions? My favorite choice of the moment is meditation. Why? Because it lets us experience how our “monkey mind” jumps around all over the place without our permission. Because it teaches the observation of mental events (thoughts) as opposed to identification with them. Because it teaches us enough mental discipline to realize we can become the container for our thoughts rather than the victim of them. Because it teaches us how to practice staying in the moment which is the only place reality can happen. But who are you then, if you are not who you thought yourself to be – not that voice in your head, not your thoughts? You can learn to become the one who sees the thoughts, the one who has awareness over and above thoughts. You become the space in which thoughts happen. You are, indeed, the vehicle through which Life is lived. Bourgeault, Cynthia. The Wisdom Jesus: Transforming Heart and Mind – a New Perspective on Christ and His Message. Boston: Shambala Publications, 2008. Hollis, James. What Matters Most: Living a More Considered Life. New York: Gotham Books, 2009. Ladinsky, Daniel, Ed. Love Poems from God: Twelve Sacred Voices from the East and West. New York: Penguin Compass, 2002. Marion, Jim. Putting on the Mind of Christ: The Inner World of Christian Spirituality. Charlottesville, VA: Hampton Roads, 2000. Muktananda, Swami. Play of Consciousness: A Spiritual Autobiography. South Fallsburg, NY: SYDA Foundation, 1978, 2000. Tolle, Eckhart. A New Earth: Awakening to Your Life’s Purpose. New York: Plume, 2005. Wilber, Ken. No Boundary: Eastern and Western Approaches to Personal Growth. Boston: Shambala Publications 1979, 2001. Wilber, Ken. Integral Spirituality: A Startling New Role for Religion in the Modern and Postmodern World. Boston: Shambala, 2006. Williams, Mark; Teasdale, John; Zindel, Segal & Kabat-Zinn, Jon. The Mindful Way through Depressions: Freeing Yourself from Chronic Unhappiness. New York: Guilford Press, 2007. Yogananda, Paramahansa. The Autobiography of a Yogi. Los Angeles: Self-Realization Fellowship, 1946, 2000.